JERUSALEM (JTA) — The wave of protests sweeping Israel is about much more than the lack of affordable housing: It’s a grass-roots demand for the major redistribution of the nation’s wealth. The current situation is partly a result of a constitutional lacuna. In the mid-1990s, a number of basic laws were passed — together they are eventually meant to form the basis of a constitution for Israel. One of the laws, on the dignity and freedom of man, enshrined property rights, but a balancing companion act on social rights continues to be held up. It would deal with issues like the right to housing, education, health and welfare, and set parameters of state responsibility for their provision. The bill again is on the agenda, promoted by Meretz Knesset member Zahava Gal-On. But the country’s current socioeconomic predicament goes much deeper than any law. It is the result of more than two decades of a virtually consistent small government economic policy. The turning point came in 1985, with inflation running at over 450 percent per annum. It became clear that Israel could no longer afford to maintain the old-style, government-subsidized welfare state. The economic stability plan introduced by then-Prime Minister Shimon Peres and then Finance Minister Yitzhak Modai entailed stringent cuts in government spending. With its dramatic success in saving the economy, the small government approach quickly became economic orthodoxy. The economic buzzword in the 1990s was privatization, started by the Likud, taken on board by Labor and then accelerated by Benjamin Netanyahu. When he first became prime minister in 1996, Netanyahu spoke of a thin man, the private sector, tottering under the weight of a fat man, the public sector, and vowed to turn things around. Netanyahu had a strong ideological commitment to free market forces, privatizing government companies and outsourcing social services. This meant the accelerated handover of services to the private sector that once were the sole preserve of government. It was accompanied by a weakening of trade unions and an overall erosion of working conditions and salaries. The result? Owners and a select few mega-salaried executives became richer and the middle class relatively poorer. It also led to the rise of the Israeli tycoons, who controlled a great deal of the country’s wealth and power. Banks, energy companies, supermarket chains and media properties all were concentrated in the hands of a dozen or so billionaire families. Netanyahu’s economic philosophy also entailed a reduction of corporate taxes. Big companies paid 5 percent to 20 percent income tax, while the middle class saw the prices of everything from food to cars to apartments rise considerably. The system produced impressive economic growth but left wealth in the hands of the few. The trickle-down effect, middle-class Israelis said, had failed to materialize. The upshot was that by May 2010, Israel’s economy was robust enough for Israel to be admitted to the Organization for Economic Cooperation and Development — the exclusive club of the world’s strongest economies known as the OECD. But Israel also was the OECD member with the biggest gaps between rich and poor. Some blame preferential spending on settlements in the West Bank for the lack of funds for social services in Israel. Others focus on welfare for the growing haredi Orthodox population in Israel. Still others point to the limited taxation of the tycoons — tax concessions nationwide are estimated at approximately $11 billion per year, about 11 percent of the national budget. For years, middle-class discontent simmered under the surface, always eclipsed by security concerns or peacemaking moves. For embattled Israel, peace and security inevitably took top priority. Until now. 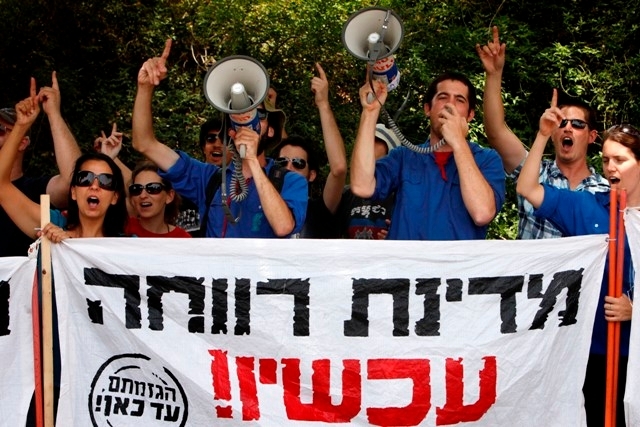 With terrorism virtually nonexistent and the peace process deadlocked, young Israelis have turned their attention toward generating a mass movement against the socioeconomic system. Their anti-establishment energy took the form of street protests because there is a strong sense that none of the traditional parties represents their interests, and Israel has a long history of street protests, encompassing everything from Ethiopian immigration to the campaign to release captive Israeli soldier Gilad Shalit. For the most part, the protests have not been focused. But now the leaders of the protest movement are formulating a list of concrete demands and general principles for change. These are expected to include demands for public housing on a large scale; major tax reforms that would increase taxation of the super-rich and lower indirect taxes on the general public; a shift in budgetary priorities, transferring part of the defense budget and the increased tax money from the rich to fund social services; and demands for Israel to comply with OECD averages when it comes to the numbers of doctors, policemen and firemen per thousand citizens, and the number of children in classrooms. Netanyahu has set up committees to examine all the relevant economic issues and to negotiate with the protesters, who are likely to be backed by trade union boss Ofer Eini. The prime minister almost certainly will produce a new economic plan, but it may not be enough. What the people are demanding is a new social contract. The political question is whether this could have an impact on the next election, scheduled for 2013, and the agenda over which it will be fought. That depends on how pressing security issues are around that time and whether these protesters can sustain enough momentum to translate their street movement into real political power.